1. Deleted transactions. When the patron's library deletes transactions from the current 90-day database, the system will retain a "shell" of the deleted transactions so that other libraries that might have been involved in the transactions can still access them for critical reporting information. Retained information is viewable only via the Ask/Reports feature. 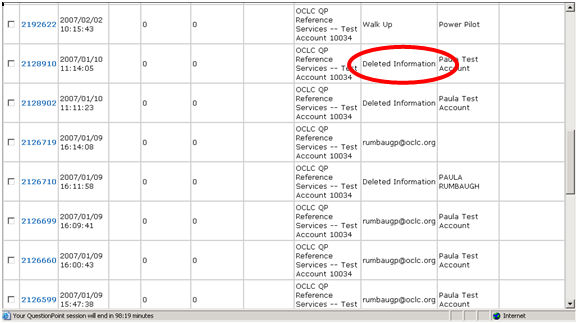 Deleted transactions are not accessible through the question lists. Users can include deleted transactions or exclude them (by selecting "All (Not Deleted)" in the limit-by-status menu) in their Ask/Reports,. But note that if excluding the deleted transactions, you are also automatically limiting your view to only those transactions that are currently being worked on at your institution. French-, Dutch-, German-, Greek-, and Russian-language KB records are now indexed using "analyzers" (or special linguistic algorithms) that are specific to each of those languages. One result is the "stemming" of certain terms to allow for automatic retrieval of records with terms based on but not exactly the same as the search terms. Records with plurals of the search term, for example, might be retrieved when a singular search term is entered. In addition, diacritics are ignored in both indexing and searching, so records are retrieved even when a diacritic is missing from the search term. This is true for all languages. 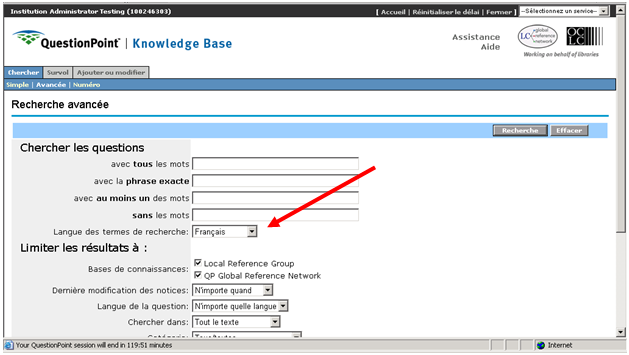 Thus, for example, bibliothèque and bibliotheque find the same records in any language, and bibliothèque, bibliothèques, bibliotheque, and bibliotheques all find the same records if the user is using the French analyzer. The service defaults to the analyzer for the language of the interface the librarian or patron is using. If a user wants to specify that their search term is in a language other than the default, they can choose the desired language on the Advanced Search page. 3. More Home Page links for 24/7 Cooperative users. The MyQuestionPoint home page now has links to policy pages and schedules, in addition to queues, to make consulting these features more convenient. 4. Support and Help links in patron accounts. A link to Support has been added above the Help link in patron accounts. 2. Automatic assignments. If libraries have implemented the automatic assignment capability for e-mails, you know that librarians assigned by that method were not being reported in some of the Ask/Reports. That has now been corrected, so that those assignments are reported and displayed just like assignments made via the standard method. 3. Unassigned list. Librarians accustomed to proceding into the Ask module from the "Unassigned" questions link on the home page will find a bug fixed that proved disruptive to workflow. Today, when you select "Unassigned" and then a specific question to open, you are returned to the full list of New questions when you click on the "Return to List" link. With the fix you will be returned to the list of Unassigned questions. A recent posting to the QuestionPoint listserv asked: "We are fairly new to doing cooperative chat (about a month) and have a question regarding closing questions. It is my understanding that we should not close questions answered by our staff for other libraries. Well, we have several questions in our queue that are now 2-3 weeks old that our staff answered and have not been closed by the owning library. So, is there a point where we can close the question, or do we just let it sit in the queue?" Answer: For those libraries who participate in the 24/7 Reference Cooperative, the guideline is to NOT close the question if the patron is not your patron. Instead, the patron library should be the one to close the question. Why? The patron library needs to review sessions to see if they need further follow up, and to review for Quality. I agree, it does lead to lots of clutter if libraries leave sessions in their Active list! Some libraries "reject" questions that appear in their Active list, but this causes a problem since that will then cause the patron library to see the session as New (even if it doesn't need follow up). Until such time as we are able to allow a way for one library to close a question without it impacting the 2nd library, please don't close a question unless it is your patron. Ideally, all Cooperative libraries would review their active question list regularly (at least weekly) and close those questions that don't need follow up and don't need to be sent to Quality. There are obviously many libraries that aren't yet in this habit. If you have lots of questions that are older than 2 or 3 weeks, let me know so that I can contact those libraries. Please discuss your thoughts on this! The dates covered by daylight savings time (DST) in the United States were changed this year. DST in the United States is now the second Sunday in March to the first Sunday in November. For 2007 the dates are 11 March 2007 to 4 November 2007. On 11 March 2007, the QuestionPoint servers, located in Dublin, Ohio United States, were adjusted to the observed daylight savings time. 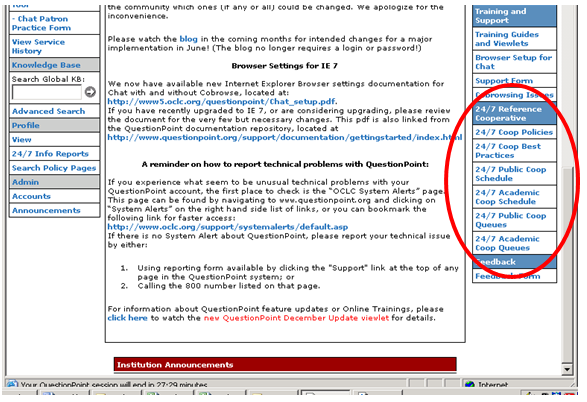 As a result, the time stamps for the questions that entered the service between 11 March 2007 and 25 March will be 1 hour ahead of the actual time the question entered the system. Please note that this time stamp is not controlled by your DST setting in the administration module. First, let us apologize for the impact these changes are having on your service. We are working to explore options for addressing this issue. We will keep you posted on this issue as we move closer to the next daylight savings time change of 28 October. Please know that the QuestionPoint Support team is willing to work with you should you have any questions about your reports and how they were impacted. We will also have a QuestionPoint update and time for discussion on software tips and best practices. Don’t miss out on this opportunity to share expertise and ask questions. When you end a chat session, you are given an opportunity to enter a Resolution Code and a Descriptive Code(or codes). You must enter a Resolution Code at the conclusion of each chat session. However, Descriptive Codes should ONLY be used for sessions with your own patrons. Why? It relates to the differing purposes of the codes. Resolution Codes directly affect the status of a question. There are 5 of them: Answered, Follow Up by Me, Follow Up by Patron Library, Lost Call, and Practice. Using one code rather than another will impact how the session appears in both your Question List and, when chatting with a patron from another library, in the Question List of the patron's library. Descriptive codes merely describe the session, for purposes of analysis. A library can use descriptive codes to see how many research (vs instructional) questions were asked by their patrons, for example, or how many business questions came in. Librarians differ as to what the individual descriptive codes mean, or when one code should be used over another code. Since reports can be generated based on the code, there is an interest within a library of maintaining the integrity of what codes to use, and when. Since each library has its own understanding and use of the codes, please refrain from assigning any descriptive code to a session from another library. If a chatting librarian does mistakenly assign a descriptive code to one of your patron's sessions, you can change it. Up to 4 codes per session may be used. However, if a chatting librarian assigns 3 codes to a session, and you only want one code, there is no way to delete the codes already assigned (you can only change a code, not delete it). Libraries do not have to use descriptive codes for their patron sessions: it is completely optional. So, always use Resolution Codes, and never use Descriptive Codes (unless you are chatting with your own patrons). QuestionPoint temporary service disruption Thursday 3/15/07. Librarians working in the Ask module could not save question notes and drafts to question replies. Patrons may have received a "closed" message, suggesting that they check their library website for hours of service or other options. The situation was reported to OCLC by staffing librarians and the system was repaired. Not all sites were affected. Those sites affected may see reflected in their reports and statistics, unusually long wait times, stats for "AfterHours" sessions, or interrupted chat sessions with no resolution code in the chat transcript. (The latter will have a status of "Answered") . Sessions that occurred during the affected time period should be examined for followup opportunities if necessary. We apologize for any inconvenience this caused to you or your patrons. Thank you for your patience and understanding as we worked to correct the QuestionPoint time-stamp issue. As part of this fix, you will notice the following differences in any QuestionPoint Questions and Chat transcripts occurring between 3/11/2007 2 AM EDT (600 GMT) and 3/14/2007 4:15 AM EDT(815 GMT). The time stamp for when the question first entered QuestionPoint has been corrected. The time stamp for any modifications to a chat transcript or question, such as change of the question’s status, will not be changed. If a question status was changed from Answered to Closed at 3 pm but the time stamp was recorded to be 2 pm due to the time change issue, the time stamp will remain as 2 pm. 9:30 a.m. — 12:30 p.m.
Join your colleagues for an update on current QuestionPoint enhancements and share your experiences and success stories with others. The special topic of discussion will be "Building and Using your Local Knowledge Base" with guest speaker Peter Armenti, Library of Congress Digital Reference Team. o Participating in a QuestionPoint "group"
For more information, please contact Holly Nickle at 202-707-4854 / [email protected] or Paulette Hasier at 202-331-5771 Ext. 206/ [email protected]. Please notify FLICC at (202) 707-4813 if you cannot attend to allow those on the waiting list an opportunity to register. Free, but advanced registration is required. Please contact Holly Nickle at [email protected] or 202-707-4854. QuestionPoint is experiencing a time-reporting problem due to the recent U.S. change to Daylight Savings Time. The QuestionPoint servers did not automatically change to the new time. Therefore, Chat sessions, reports, and emails are incorrectly time-stamped with the old U.S. Standard Time, causing those clients who switched to Daylight Savings Time on Sunday March 11 to see a one hour discrepancy. We are attempting to fix this problem and anticipate that it will be corrected the evening of Tuesday March 13th. We will send an advisory out if QuestionPoint service will have to be interrupted to fix this problem. We apologize for the inconvenience. The librarian’s screen name identifies the librarian, thus communicating to the patron who they are talking to. The screen name should contain a personal name (it does not have to be the librarian’s actual name) so that the patron will know he is talking to an actual individual (a person and not an automated system). The screen name should also contain a fairly understandable affiliation so that the patron will be aware that the librarian is not their local librarian. Abbreviations in general should be avoided since they may be unintelligible to the patron and cause confusion.